They have finally landed all the way from the States! These Maybelline Baby Lips are surrounded by a huge hype, but are they worth it? I couldn't resist picking up these two, since I really wanted to review them and see if these much awaited products were actually any good. I picked up Cherry Me (cherry scented with a sheer red finish) and Pink Punch (passion fruit scented with a sheer pink finish). Firstly, for those of you that don't already know, these are basically glorified lip balms. Even though they are only £3 each, you could still pick up a tinted lip balm for less. Secondly, Maybelline claim that they hydrate the lips for up to 8 hours, which I don't agree with. I'd say they hydrate the lips for around an hour maximum before I'm itching to reapply. The reason for this is because they contain petroleum which usually sits over the lips masking how dry your lips really are rather than actually hydrating them. Thirdly, I was expecting all 6 of the different Baby Lips in the range to contain SPF 20, but only 3 of the completely non-tinted ones do, therefore the two I picked up do not. 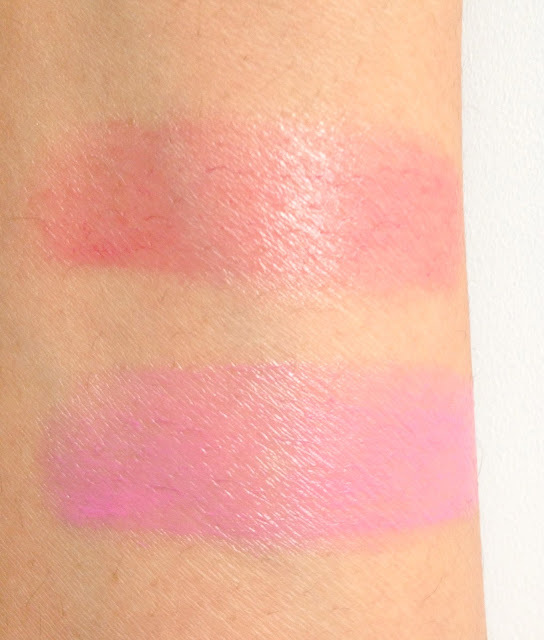 Finally, the pigmentation - I'm aware that they are just meant to provide a sheer wash of colour, but I'd seen some swatches from Stateside beauty bloggers that looked rather pigmented, so I was hoping for more. Now on to the positives - They smell really lovely, the packaging is rather cute and dinky, and they do make a great product to pull out of your handbag for a quick application as they aren't very tinted so you can't go wrong applying this without a mirror. This definitely is a great product for anyone still in school as they look cute and they're affordable. Also for anyone new to wearing lipsticks, these reds and pinks would ease you in to wearing brighter colours. In my opinion, they aren't worth the incredible hype that somehow surrounds them, for all of the reasons above. I am disappointed since I do think that Maybelline usually get it right. If they reformulate them to at least be more hydrating or provide SPF then they'd be onto a winner! Have you tried the much coveted Baby Lips?